This article is about the English football goalkeeper. For the Arizona state mine inspector, see Joe Hart (politician). For other people with the same name, see Joseph Hart. * Senior club appearances and goals counted for the domestic league only and correct as of 22:18, 27 November 2016 (UTC). Charles Joseph John "Joe" Hart (born 19 April 1987) is an English professional footballer who plays as a goalkeeper for Serie A club Torino, on loan from Premier League club Manchester City, and the England national team. With over 100 Premier League clean sheets, Hart holds the record for the most Premier League Golden Glove awards (four) and has amassed over 60 international caps since his debut in 2008. Hart was born in Shrewsbury, Shropshire, to Charles and Louise Hart, and attended Oxon Primary School, followed by Meole Brace School in Shrewsbury, where he was Head Boy in his final year. As a schoolboy, he was an equally competent cricketer and briefly played for Shrewsbury CC in the Birmingham and District Premier League and also spent two years in Worcestershire's youth squads, playing alongside England cricketer Steven Davies. While still a 15-year-old schoolboy, Hart travelled with the first-team squad of his hometown club, Shrewsbury Town, to Exeter City on 1 February 2003. He was a non-playing substitute on that occasion and fulfilled that role again versus Rochdale at Gay Meadow on 1 March 2003, still some six weeks short of his 16th birthday. This match yielded Shrewsbury's final victory in a season that culminated in relegation to the Football Conference. During the one season that Shrewsbury spent in the Conference, Hart made his senior debut on 20 April 2004, a day after his 17th birthday. He played the full 90 minutes in the match against Gravesend & Northfleet. Four days later, he conceded three at Morecambe. Hart did not play again until April of the following year, as Scott Howie dominated goalkeeping duties. With Shrewsbury back in the Football League (the newly renamed League Two) and struggling, Hart played six matches, conceding four goals. 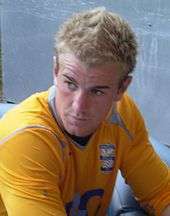 From the start of the 2005–06 season, Hart made the step up into the first team, and became the club's first-choice goalkeeper. He played a full 46-match league season, conceding 55 goals. Despite conceding more than one goal per game, Hart won plaudits for his personal performances, winning his first England under-19 cap in October 2005, as a substitute against Poland. Hart also found admirers in the Premier League, with several top-flight scouts attending matches. On 30 November 2005, the Shropshire Star newspaper reported that Everton goalkeeping coach Chris Woods had been present at Town's previous league match, a 4–3 loss at Rochdale. Manager Gary Peters said "Everton have been to watch him, but you could say the same about Arsenal, Chelsea and every other team in the Premiership." Speculation about his future continued for the duration of the season, and with the presence of their goalkeeping coach Tim Flowers at several matches, Manchester City became the most likely of his suitors. Hart was announced as the top League Two player for January 2006 in the PFA Fans' Player of the Month Awards, voted for by fans via the Professional Footballers' Association website. At the PFA Awards ceremony on 23 March 2006, it was announced that Hart had been voted as League Two's best goalkeeper for 2005–06 by his fellow professionals, earning him a place in the PFA League Two Team of the Year. Hart's move to Manchester City was completed as soon as Hart returned from England under-19 duty in Belgium, where a defeat to Serbia and Montenegro in the elite round meant England failed to qualify for the 2006 UEFA European Under-19 Championship. It was reported at the time that City were to pay an initial £600,000 fee for Hart, rising to £1.5 million if undisclosed clauses were achieved, but John Wardle, then City chairman, revealed in 2012 that the transfer fee was actually £100,000. Hart was recommended to City hierarchy by the club's goalkeeping coach Tim Flowers who believed he had great potential. 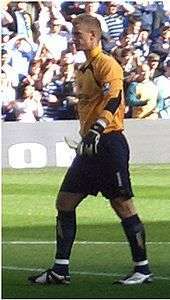 Hart made his debut for City on 14 October 2006 after injuries ruled out Andreas Isaksson and Nicky Weaver for the Premier League match against Sheffield United. He kept a clean sheet in the match, which finished goalless. Hart spent January 2007 on loan to League One club Tranmere Rovers. He made six appearances and conceded eight goals. He was then named in his then club manager Stuart Pearce's first squad in his part-time role as England U21 coach, alongside another goalkeeper uncapped at U21 level, Ben Alnwick. He was not chosen to start the match on 6 February 2007 against Spain, but did come on as a substitute late in the game. In April 2007, Hart joined Blackpool on loan as cover for the injured trio of Rhys Evans, Paul Rachubka and Lewis Edge. He kept a clean sheet in a 2–0 win for Blackpool away to Huddersfield Town on 9 April 2007, in his first game for the Seasiders. Blackpool won all five games in which Hart appeared, including a 6–3 win away to Swansea City in his final game. On his return from a successful loan spell at Blackpool, former Manchester City manager, Sven-Göran Eriksson, named Hart as Manchester City's number 1 ahead of Andreas Isaksson. After his performance against Newcastle United, Eriksson named him as "one of the biggest talents in this country as a goalkeeper", and that he had the potential to become an England international in the future. Only months later, he made his England debut against Trinidad and Tobago on 1 June 2008. In October, he was inducted to Shropshire Schools & Colleges Football Association's Hall of Fame along with former teammate David Edwards in recognition of their achievements. Later that month, he signed a new five-year contract. After Isaksson's departure to PSV Eindhoven, Hart took the vacant number 1 jersey when the official squad numbers for the 2008–09 season were announced. However, his position as first-choice keeper was taken by Shay Given upon the Irishman's arrival at the club in January 2009. Having played no games for City since Given's arrival, rumours began to emerge of a loan move away from Manchester. City secured the transfer of Stuart Taylor from Aston Villa on 23 June 2009, paving the way for Hart to leave. The following day it was announced that Hart would spend the 2009–10 Premier League season on loan to newly promoted Birmingham City. He made his debut in Birmingham's opening match of the season, a 1–0 defeat away to Manchester United. In the early part of the season, Hart made some errors which cost Birmingham City goals, and Maik Taylor's clean sheet against Manchester City, a match for which Hart was ineligible, left manager Alex McLeish with a selection dilemma. McLeish chose Hart, who kept his place in the starting eleven as Birmingham went on a club-record 12-match unbeaten run in the top division and set a Premier League record by fielding the same starting eleven for nine consecutive games. His performances improved: against Chelsea in December, he "showed not only sharp judgment and reflexes, making three outstanding saves ... but a lack of fear also", despite needing staples in a gashed head sustained when diving at the feet of Salomon Kalou. Hart was voted Birmingham City's Player of the Year for 2009–10, and nominated for the 2010 PFA Young Player of the Year award alongside Wayne Rooney, Cesc Fàbregas and James Milner. Though Milner won that award, Hart earned a place in the PFA Team of the Year. After a successful spell at Birmingham, Hart earned a place in the England squad for the 2010 FIFA World Cup in South Africa. Manchester City manager Roberto Mancini was unsure over the future of Hart and dispatched his goalkeeping coach, Massimo Battara to watch over him during his loan spell at Birmingham City. Battara reported that Hart was a "very good goalkeeper, with very high physical and technical abilities" and advised that he kept Hart in his plans for the years ahead. One of the major pre-season debates was whether Hart would start ahead of the experienced Shay Given after his return to City following an impressive loan spell with Birmingham City. 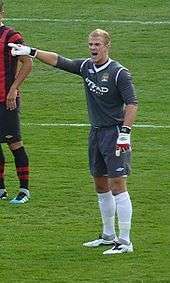 Hart was chosen ahead of Shay Given to start the opening game of the 2010–11 season against Tottenham Hotspur. He produced a man of the match performance, saving numerous challenging shots including a deflected effort from Benoît Assou-Ekotto, which helped City to draw the game 0–0. Hart also kept a clean sheet in Manchester City's 3–0 victory over Liverpool, where he was still first-choice goalkeeper and made even more good saves, enhancing his reputation even further. Hart conceded his first goal of the season from a late penalty by Darren Bent in a 1–0 defeat at Sunderland, and made an error that led to Blackburn Rovers' opening goal in a 1–1 draw two weeks later. Hart helped his team overcome Manchester United in the FA Cup semi-final by producing an excellent early save to deny Dimitar Berbatov the opening goal; the match ended 1–0 to City, thanks to a goal scored by Yaya Touré. He kept another clean sheet against Tottenham Hotspur to earn his team a place in the Champions League for the first time, and another in the FA Cup final in which Manchester City beat Stoke City 1–0 with another goal from Touré. Hart's 18 clean sheets in the 2010–11 Premier League season earned him the Premier League Golden Glove award. He also set a new club record for the most clean sheets during a season, with 29; the previous mark was set by Nicky Weaver with 26 when the team were playing two divisions lower. He also received City's Performance of the Season award for the match against Tottenham Hotspur in August 2010. Hart's position as City's "number one" was cemented when Given departed City for Aston Villa in July 2011. On 8 August 2011, he signed a new contract until 2016. Hart won the Golden Glove award for the second year running in 2011–12, and helped City to win their first Premier League title, and first top-flight title for 44 years, which they clinched on the final day of the season by beating Queens Park Rangers 3–2. Hart's form dipped in the 2012–13 Premier League season, although he still won the Golden Glove award for keeping most clean sheets despite rivals Manchester United regaining their title as revenge for the previous season's last-day title win on goal difference. He started in goal for Manchester City in the 2013 FA Cup Final against Wigan Athletic but let in a 90th-minute header by Ben Watson; Wigan won 1–0, and City ended the season without winning a trophy. His form continued to dip in the 2013–14 Premier League season and, following conceding a decisive 90th-minute goal by Fernando Torres in a 2–1 loss to Chelsea at Stamford Bridge on 27 October, he was replaced by Costel Pantilimon for a home match against Norwich City which City won 7–0. A month later, Hart returned to the Manchester City team for a Champions League group match against Viktoria Plzeň. Hart regained his place as City's starting goalkeeper in the Premier League in a 4–2 win over Fulham on 21 December 2013, and remained first choice as the team went on to win the league for the second time in three seasons. On 24 February 2015, Hart saved a penalty kick from five-time FIFA Ballon d'Or winner Lionel Messi in a Champions League round of 16 fixture against Barcelona. After the return leg of the same tie Messi described Hart as a "phenomenon" after a performance where he produced a record-breaking 10 saves during the match. Hart ended the 2014–15 season by keeping a clean sheet against Southampton in his 300th appearance for Manchester City to win the Premier League Golden Glove award for the fourth time. As he had been in 2014, Hart was on the bench for the 2016 Football League Cup Final; this time, his understudy Willy Caballero featured in a penalty shootout victory against Liverpool. On 6 April, Hart saved a penalty kick from Zlatan Ibrahimović in Manchester City's Champions League quarter-final first leg against Paris Saint-Germain at the Parc des Princes. It was his second penalty save of the season's competition, after previously keeping out Raffael's kick in a 2–1 group stage win at Borussia Mönchengladbach on 30 September 2015. On 13 August 2016, Hart was dropped by new manager Pep Guardiola for the first match of the 2016–17 Premier League season. The absence followed his poor performances in Euro 2016, and Guardiola's desire for a player with better footwork who could fill a sweeper-keeper role. Hart made his first start of the 2016–17 season in a Champions League qualifying match against Steaua, as captain of the City side that won 1–0 on the night, 6–0 on aggregate. Following the match, Hart was applauded by the crowd, in an atmosphere which was described as resembling a pre-departure testimonial. Following speculation linking Hart with various top flight European clubs, including Sunderland, Everton, Liverpool, Arsenal, Borussia Dortmund, Sevilla, Milan and Torino, Hart decided to pursue a season-long loan in the Serie A with Torino. In doing so, he became the first English goalkeeper to sign for a Serie A club since the league's inception in 1929. On 11 September 2016, Hart suffered a tough start in his debut for Torino, being partly at fault for the first equaliser in a 2–1 away defeat to Atalanta when his punch from a corner fell at the feet of an opposing attacker who scored. This shaky start, however, proved only temporary as Hart kept consecutive clean sheets in his next two games against Empoli and Pescara, both of which ended 0-0, making several important and acrobatic saves in the latter despite his side being down to 9 men. Hart made his first international appearance in September 2005 in an England under-19 friendly match against Belgium at Darlington; replacing starting goalkeeper Ben Alnwick at half-time, he was unable to save the penalty that made the score 3–2, but with three minutes left made a "terrific one on one save" from an unmarked attacker. He played in five more matches for the under-19s, his last a 1–0 defeat away to Serbia and Montenegro on 22 May 2006. After making his under-21 debut as a substitute for Scott Carson in a 2–2 draw with Spain, Hart was selected by Stuart Pearce in the preliminary England Under-21 30-man squad for the 2007 UEFA European Under-21 Championship, and made the final 23. In the team's final friendly before the finals, Hart was selected for his first under-21 start, and played the full 90 minutes in a 5–0 win over Slovakia at Carrow Road. However, Hart took no part in the finals, with Carson playing in all four of England's fixtures. Hart played in all the qualifying matches for the 2009 European Championships, In the finals, he started the first two group-stage matches and was rested for the last match as England had already sealed their passage to the knock-out stage. In the semi-final against Sweden, he conceded three goals in the second half as the match ended 3–3 after extra time, but made up for it by saving a penalty and scoring another as England won 5–4 in the shoot-out. However, he was yellow-carded for leaving his line to talk to Mikael Lustig as he prepared to take his penalty. England's appeal was rejected, so Hart was suspended for the final; Scott Loach kept goal as England lost 4–0 to Germany. Having been a regular in the England under-21 squad, Hart was called up by Fabio Capello to the senior England team for the friendly matches against the United States and Trinidad and Tobago. An unused substitute against the United States, he made his debut against Trinidad and Tobago on 1 June 2008 at the Hasely Crawford Stadium, Port of Spain. He came on at half time for David James with England 2–0 up, eventually running out 3–0 winners. However, Hart's senior England debut did not earn Shrewsbury Town the expected bonus of £500,000 from Manchester City, as negotiated at part of his transfer in 2006, because it was not a competitive match. Hart kept his place in the squad for a friendly against the Czech Republic in August, but remained unused. After Blackburn Rovers goalkeeper Paul Robinson withdrew from the squad for World Cup qualifiers against Ukraine and Belarus in October 2009, Hart took his place, and in November, he was called up for a friendly against Brazil, but he did not appear in either match. Capello named Hart in his provisional 30-man squad for the 2010 FIFA World Cup. Hart played the second half of both of England's warm-up games, replacing Robert Green against Mexico and James against Japan, and kept a clean sheet in each case. All three goalkeepers, Hart, Green and James, were included in the final 23-man selection. Hart did not feature in the World Cup but started England's next match, a friendly against Hungary, to earn his fourth cap. He conceded his first England goal in dubious circumstances when the ball appeared not to have crossed the line from a deflection from Phil Jagielka, and made a vital late save from Zoltan Gera as England won 2–1. Hart was given his first competitive cap in a UEFA Euro 2012 qualifier, a 4–0 win against Bulgaria at Wembley; he made three crucial saves, one of which he palmed away to begin the counterattack that led to an England goal. He won another two caps November 2011 in friendlies against world champions Spain and Sweden, in each case keeping a clean sheet in a 1–0 England victory. In February 2012, after the position was stripped from John Terry, some players and pundits backed Hart for England captaincy citing his strong performances and positive image. On 16 May 2012, new England manager Roy Hodgson named Hart in his UEFA Euro 2012 squad. He played in England's second warm-up friendly, against Belgium at Wembley, keeping a clean sheet as England won 1–0. In the tournament he played a key role in England getting to the quarter-final. His confident demeanour was refreshing and made the most saves of any goalkeeper in the tournament with nineteen. 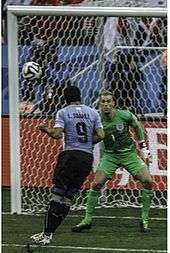 However, he was beaten by Andrea Pirlo's panenka shot in the penalty shootout: Pirlo had stated that Hart's antics led to him thinking that "he had to get off his high horse". On 6 February 2013, Hart saved a penalty kick and the subsequent follow-up shot from Ronaldinho in a friendly match against Brazil at Wembley Stadium. This double save proved to be crucial in helping England win the match 2–1, and thereby securing their first win over Brazil for 23 years. Hart was selected for his second FIFA World Cup in 2014. He made his tournament debut in England's first group match, a 2–1 defeat to Italy in Manaus, and also played in the next match, a loss by the same scoreline to Uruguay. With England not likely to advance, Hodgson made changes for their last game, against Costa Rica, with Ben Foster playing in goal instead. In October 2014, England fans voted Hart man of the match against San Marino – in which he made only one save and rarely touched the ball – and repeated the exercise a few days later against Estonia; Jack Wilshere was the official best player in each fixture. Hart became the sixth English goalkeeper to earn his 50th cap, in a 1–1 friendly draw against Italy at Juventus Stadium on 31 March 2015. On 13 November that year, with Rooney rested, he captained England for the first time in a 2–0 friendly defeat to Spain in Alicante. Hart was included in England's 23-man squad for Euro 2016. In the second match, against Wales in Lens, he made an error to allow Gareth Bale to score from a long-range free kick, although England came back to win 2–1. Hart made another mistake to let in a winning goal from Kolbeinn Sigþórsson in the defeat to Iceland in the last 16, after which he admitted that criticism of the team would be justifiable. In September 2016, having not played a single league match for either Manchester City, nor Torino, Hart started England's first 2018 FIFA World Cup qualifier against Slovakia. England won 1-0. On 27 June 2015, Hart married Kimberley Crew, his girlfriend of six years, in Florence, Italy. 1 2 Hugman, Barry J., ed. (2010). The PFA Footballers' Who's Who 2010–11. Edinburgh: Mainstream Publishing. p. 189. ISBN 978-1-84596-601-0. 1 2 3 "Players: Goalkeepers: Joe Hart". Manchester City F.C. Retrieved 4 June 2016. ↑ "Hart wins Golden Glove award for Manchester City - Manchester City FC". Mcfc.co.uk. Retrieved 12 May 2014. ↑ David Anderson (14 September 2015). "'Real leader' Joe Hart is now the best goalkeeper in the world, says Gianluigi Buffon". The Mirror. Retrieved 18 January 2016. ↑ Wilson, Jeremy (13 May 2011). "Manchester City keeper Joe Hart could be England's most capped player ever, says David James". Daily Telegraph. London. Retrieved 13 May 2011. ↑ Ellis, Ralph (5 September 2010). "How Joe became a Hart stopper: England's No 1 was in a different class even as a toddler". Daily Mail. London. Retrieved 6 September 2010. 1 2 Taylor, Daniel (29 August 2009). "Joe Hart 'would love' to play for Manchester City again". The Guardian. London. Retrieved 6 May 2010. ↑ "Exeter City v Shrewsbury Town, 01 February 2003". 11v11. 1 February 2003. Retrieved 29 May 2016. ↑ "Shrewsbury Town v Rochdale, 01 March 2003". 11v11. 1 March 2003. Retrieved 29 May 2016. ↑ "Shrewsbury Town's results from season 2002/2003". Shrewsbury Town Mad. Retrieved 29 May 2016. 1 2 "Goalkeeper Joe Hart signs new 5-year deal at Man City". BBC Sport. 2011-08-08. Retrieved 2014-05-12. 1 2 "On this day: Joe Hart debuts at Shrewsbury". Shropshire Star. 20 April 2016. Retrieved 29 May 2016. ↑ "Morecambe 3–3 Shrewsbury Town". Sky Sports. 24 April 2004. Retrieved 29 May 2016. 1 2 Bailey, Mark (11 January 2013). "Manchester City and England in safe hands with Joe Hart between the posts". Daily Telegraph. Retrieved 4 June 2016. ↑ "Joe Hart". ESPN. Retrieved 29 May 2016. ↑ "Joe Hart – England's Number 1 Goalkeeper". Keeper Portal. 17 June 2012. Retrieved 29 May 2016. ↑ "Everton watch young Keeper". Nil Satis Nisi Optimum - Everton fans forum. 2 December 2005. Retrieved 29 May 2016. 1 2 "Joe Hart: England goalkeeper at World Cup 2010". The Telegraph. 10 May 2010. Retrieved 29 May 2016. ↑ "Euro 2012: England goalkeeper Joe Hart can win over 100 caps insists Tim Flower who spotted talent early". The Telegraph. 7 June 2012. Retrieved 29 May 2016. ↑ Smith, Dave (7 February 2006). "PFA Fans' Player of the Month Awards for January 2006". Professional Footballers' Association. Archived from the original on 5 December 2008. 1 2 "Gerrard named player of the year". BBC Sport. 23 April 2006. Retrieved 22 May 2006. ↑ "England fail to qualify". The Football Association. 22 May 2006. Retrieved 4 May 2015. ↑ "Goalkeeper Hart to join Man City". BBC Sport. 24 May 2006. Retrieved 22 May 2006. ↑ Spencer, Peter (6 October 2012). "Why Manchester City fans have former Blues chief to thank for the signing of hero Joe Hart". Manchester Evening News. Retrieved 4 May 2015. ↑ James, Stuart (15 October 2006). "Easy for Warnock to make point". The Observer. London. Retrieved 12 August 2014. ↑ "Tranmere sign City keeper on loan". BBC Sport. 1 January 2007. Retrieved 4 June 2016. 1 2 3 4 "Games played by Joe Hart in 2006/2007". Soccerbase. Centurycomm. Retrieved 30 November 2014. ↑ "England U21 2–2 Spain U21". BBC Sport. 6 February 2007. Retrieved 4 June 2016. ↑ "Transfers - April 2007". BBC Sport. 26 April 2007. Retrieved 4 June 2016. ↑ "Huddersfield 0–2 Blackpool". BBC Sport. 9 April 2007. Retrieved 9 April 2007. ↑ "Swansea 3–6 Blackpool". BBC Sport. 5 May 2007. Retrieved 12 May 2007. ↑ Winter, Henry (4 January 2008). "Joe Hart's rise gives England hope". The Telegraph. Retrieved 4 June 2016. ↑ Frazer, Peter (3 January 2008). "Eriksson backing for Hart". Sky Sports. 1 2 Bailey, Graeme (2 June 2008). "Three and easy for England". Sky Sports. Retrieved 27 June 2010. ↑ "Manchester City star Joe Hart in Shropshire hall of fame". Shropshire Star. 23 October 2008. Retrieved 4 May 2015. ↑ "Hart agrees to five-year City contract". Shropshire Star. 27 October 2008. Retrieved 4 May 2015. ↑ "Manchester City » Squad 2008/2009". WorldFootball.net. Retrieved 4 June 2016. ↑ Winter, Henry (11 February 2009). "England's Fabio Capello still keen on Joe Hart". The Telegraph. Retrieved 4 June 2016. ↑ "Brum to take Hart". The Sun (London). 12 June 2009. Retrieved 5 July 2009. ↑ "Manchester City sign goalkeeper Stuart Taylor from Aston Villa". The Guardian. 23 June 2009. Retrieved 4 June 2016. ↑ "Hart seals Birmingham loan move". BBC Sport. 24 June 2009. Retrieved 24 June 2009. ↑ Soneji, Pranav (16 August 2009). "Man Utd 1–0 Birmingham". BBC Sport. Retrieved 1 February 2010. ↑ Walker, Andy (4 November 2009). "Maik Taylor gives Alex McLeish a selection poser". Birmingham Mail. Retrieved 1 February 2010. ↑ "McLeish proud of Blues". Sky Sports. 9 January 2010. Retrieved 28 February 2010. ↑ Tyler, Martin (12 January 2010). "The cold rush". Sky Sports. Retrieved 24 November 2015. ↑ Tattum, Colin (8 December 2009). "Birmingham City keeper tipped by boss for England role at World Cup". Birmingham Mail. Archived from the original on 30 September 2012. ↑ Tattum, Colin (28 December 2009). "Birmingham City 0, Chelsea 0: Colin Tattum's big match verdict". Birmingham Mail. Archived from the original on 15 October 2012. 1 2 "Joe Scoops Top Award!". Birmingham City F.C. 10 May 2010. Archived from the original on 14 May 2010. ↑ "Man Utd striker Wayne Rooney shortlisted for PFA award". BBC Sport. 15 April 2010. Retrieved 26 April 2010. ↑ "Rooney is PFA player of the year". BBC Sport. 25 April 2010. Retrieved 4 May 2015. 1 2 Castles, Duncan (15 June 2012). "Euro 2012: Italian influence made Hart grow fonder". The National. Abu Dhabi. Retrieved 27 June 2012. ↑ Ridge, Joe (9 August 2010). "Shay Given v Joe Hart: The facts behind the fight to be Manchester City's No 1". Daily Mail. London. Retrieved 27 June 2012. 1 2 "Hart keeps Spurs at bay". Sky Sports. 14 August 2010. Archived from the original on 15 August 2010. Retrieved 15 August 2010. ↑ McNulty, Phil (23 August 2010). "Man City 3–0 Liverpool". BBC Sport. Retrieved 4 June 2016. ↑ Darling, Kevin (29 August 2010). "Sunderland 1–0 Man City". BBC Sport. Retrieved 4 June 2016. "Manchester City goalkeeper Joe Hart admits goal blunder". BBC Sport. 13 September 2010. Retrieved 4 June 2016. ↑ McNulty, Phil (16 April 2011). "Man City 1–0 Man Utd". BBC Sport. Retrieved 4 June 2016. ↑ McNulty, Phil (10 May 2011). "Man City 1–0 Tottenham". BBC Sport. Retrieved 4 June 2016. 1 2 McNulty, Phil (14 May 2011). "Man City 1–0 Stoke". BBC Sport. Retrieved 4 June 2016. 1 2 3 Smith, Peter (18 May 2016). "Petr Cech wins Premier League Golden Glove award". Sky Sports. Retrieved 4 June 2016. ↑ "Manchester City and England goalkeeper Joe Hart's show-stopping story of success". Daily Telegraph. 3 June 2011. Retrieved 4 June 2016. 1 2 Oscroft, Tim (23 May 2011). "Kompany lands Player of the Year double". Manchester City F.C. Archived from the original on 26 May 2011. ↑ "Shay Given signs for Aston Villa on a five-year deal". The Guardian. London. 18 July 2011. Retrieved 25 August 2011. ↑ Clayton, David (11 May 2012). "Hart wins Golden Glove award". Manchester City F.C. Archived from the original on 13 May 2012. Retrieved 14 May 2012. 1 2 3 McNulty, Phil (13 May 2012). "Manchester City 3–2 QPR". BBC Sport. Retrieved 14 May 2012. ↑ Jackson, Jamie (20 March 2013). "Joe Hart admits he is affected by criticism from Roberto Mancini". The Guardian. London. Retrieved 4 June 2016. ↑ Hayward, Paul (22 April 2013). "Manchester United's Premier League title triumph was fuelled by Alex Ferguson's desire to get revenge on City". Daily Telegraph. London. Retrieved 4 June 2016. ↑ McNulty, Phil (11 May 2013). "FA Cup final: Manchester City 0–1 Wigan Athletic". BBC Sport. Retrieved 14 May 2012. ↑ Bate, Adam (30 October 2013). "Say it ain't so, Joe". Sky Sports. Retrieved 4 June 2016. McNulty, Phil (27 October 2013). "Chelsea 2–1 Manchester City". BBC Sport. Retrieved 4 June 2016. "Joe Hart: Manchester City keeper dropped for the Norwich game on 3 November". BBC Sport. 1 November 2013. Retrieved 4 June 2016. "Manchester City 7 Norwich 0: Costel Pantilimon has little to do as City hit seven". Evening Standard. London. 2 November 2013. Retrieved 4 June 2016. ↑ Rich, Tim (28 November 2013). "Manchester City 4 Plzen 2 match report: Joe Hart puts in error-free display in Champions League game vital perhaps only for him". The Independent. London. Retrieved 4 May 2015. ↑ "Fulham 2–4 Manchester City". BBC Sport. 21 December 2013. 1 2 "Hart and Milner win Premier League with Manchester City". The Football Association. 11 May 2015. Retrieved 4 June 2016. ↑ "Man City 1–2 Barcelona - reaction". BBC Sport. 25 February 2015. Retrieved 4 May 2015. ↑ "Lionel Messi calls Joe Hart a 'phenomenon' after Barcelona win". BBC Sport. 19 March 2015. Retrieved 4 May 2015. ↑ Magowan, Alistair (18 March 2015). "Barcelona 1–0 Manchester City (agg 3–1)". BBC Sport. Retrieved 4 May 2015. ↑ "Hart grabs Golden Glove award". Manchester City F.C. 24 May 2015. Retrieved 4 June 2016. 1 2 3 McNulty, Phil (2 March 2014). "Manchester City 3–1 Sunderland". BBC Sport. Retrieved 4 June 2016. Taylor, Daniel (28 February 2016). "Willy Caballero shootout heroics help Manchester City past Liverpool". The Guardian. London. Retrieved 28 February 2016. ↑ Doyle, Paul (6 April 2016). "PSG 2–2 Man City As it happened". The Guardian. London. Retrieved 4 June 2016. ↑ "Pellegrini praises Joe Hart as penalty save helps Man City beat Gladbach". ESPN FC. 30 September 2015. Retrieved 4 June 2016. ↑ Rathborn, Jack (2016-08-13). "Pep Guardiola makes huge call to drop England star in first City game". Retrieved 2016-08-14. ↑ "Joe Hart: Man City goalkeeper can leave - Pep Guardiola". BBC Sport. Retrieved 30 August 2016. ↑ Johnston, Neil (24 August 2016). "Manchester City 1-0 (agg: 6-0) Steaua Bucharest". BBC Sport. British Broadcasting Corporation. Retrieved 25 August 2016. ↑ Bascombe, Chris. "Man City 1 Steaua Bucharest 0 (agg 6-0), Joe Hart leads City through to Champions League group stage on emotional night for 'No 1'". Daily Telegraph. Retrieved 30 August 2016. ↑ "Hart joins Torino on season-long loan deal - agent". Reuters. Retrieved 30 August 2016. ↑ "Joe Hart loses on Torino debut". BBC Sports. 11 September 2016. ↑ "Le pagelle di Torino-Empoli 0-0". 2016-09-18. Retrieved 2016-09-22. ↑ "Pescara-Torino 0-0: Acquah e Vives espulsi". Retrieved 2016-09-22. ↑ Mann, Garry (7 September 2005). "England under 19's claim 3–2 win over Belgium". Darlington F.C. Retrieved 4 June 2016. 1 2 "England's matches: the under-19s 1991–2010". England Football Online. 27 August 2014. Retrieved 4 June 2016. 1 2 "Joe Hart". The Football Association. Retrieved 4 June 2016. ↑ "FA names 30-man England U21 squad". BBC Sport. 10 May 2007. Retrieved 4 June 2016. "Bentley picked for England U21s". BBC Sport. 30 May 2007. Retrieved 4 June 2016. 1 2 "England's matches: the under-21s 2001–2010". England Football Online. 23 February 2014. Retrieved 4 June 2016. ↑ "2006/07 UEFA European Under-21 Championship: England under-21 squad". UEFA. 20 March 2013. Retrieved 4 June 2016. 1 2 "England keeper Joe Hart will miss European U21 Championship final after appeal rejected". Daily Telegraph. 28 June 2009. Retrieved 4 June 2016. 1 2 Hytner, David (26 June 2009). "Joe Hart heroics earn final place after Sweden fight back". The Guardian. London. Retrieved 4 June 2016. ↑ Harrold, Michael (30 June 2009). "Germany claim first Under-21 crown". UEFA. Retrieved 4 June 2016. ↑ "Town In Wait For Extra Hart Money". Shropshire Star. 1 July 2008. Retrieved 4 May 2015. ↑ "Capello names Heskey in favour of Young, Crouch and Bent". The Guardian. London. 17 August 2008. Retrieved 4 June 2016. ↑ "Hart and Cahill receive England call". The Independent. London. 6 October 2009. Retrieved 4 June 2016. ↑ "Darren Bent called up to England squad for friendly against Brazil". The Guardian. London. 8 November 2009. Retrieved 6 May 2010. 1 2 "Charles Joseph Hart". englandstats.com. Davey Naylor. Retrieved 4 June 2016. ↑ "Fabio Capello makes surprise England World Cup choices". BBC Sport. 11 May 2010. Retrieved 1 June 2010. ↑ McNulty, Phil (24 May 2010). "England 3–1 Mexico". BBC Sport. Retrieved 1 June 2010. ↑ Vesty, Marc (30 May 2010). "Japan 1–2 England". BBC Sport. Retrieved 1 June 2010. ↑ "Theo Walcott left out of England squad". BBC Sport. 1 June 2010. Retrieved 1 June 2010. ↑ Gerrard, Paul (2 September 2010). "England 2–1 Hungary". BBC Sport. Retrieved 4 June 2016. ↑ "Defoe hat-trick helps batter Bulgaria". FourFourTwo. 3 September 2010. Retrieved 4 June 2016. ↑ McNulty, Phil (12 November 2011). "International friendly: England 1–0 Spain". BBC Sport. Retrieved 4 June 2016. McNulty, Phil (15 November 2011). "International friendly: England 1–0 Sweden". BBC Sport. Retrieved 4 June 2016. ↑ "Give Hart the England armband! City duo back team-mate to replace Terry". The Daily Telegraph. London. 13 February 2012. Retrieved 19 February 2012. ↑ White, Duncan (4 February 2012). "Joe Hart could lead England after Steven Gerrard short-term fix". The Daily Telegraph. London. Retrieved 19 February 2012. ↑ "England Euro 2012 squad – Ruddy, Carroll & Defoe in, Ferdinand out". BBC Sport. 16 May 2012. Retrieved 4 June 2012. ↑ "England 1–0 Belgium". BBC Sport. 2 June 2012. Retrieved 4 June 2012. ↑ Fifield, Dominic (21 June 2012). "Euro 2012: Joe Hart justifies hype to lead England's renaissance". The Guardian. London. Retrieved 27 June 2012. ↑ "Pirlo: Germany is afraid of Italy". Goal.com. 26 June 2012. Retrieved 12 May 2014. ↑ McNulty, Phil (21 March 2013). "England 2–1 Brazil". BBC Sport. Retrieved 21 March 2013. ↑ "World Cup 2014: England name Ross Barkley in squad". BBC Sport. 12 May 2014. Retrieved 12 August 2014. ↑ McNulty, Phil (15 June 2014). "England 1–2 Italy". BBC Sport. Retrieved 12 August 2014. ↑ McNulty, Phil (19 June 2014). "Uruguay 2–1 England". BBC Sport. Retrieved 12 August 2014. ↑ McNulty, Phil (24 June 2014). "Costa Rica 0–0 England". BBC Sport. Retrieved 12 August 2014. ↑ de Menezes, Jack (10 October 2014). "England vs San Marino: Joe Hart hilariously voted man of the match despite making just ONE save". The Independent. London. Retrieved 4 June 2016. Sale, Charles (15 October 2014). "FA bid to revamp England man of the match after fans vote for Joe Hart twice in a row". Daily Mail. London. Retrieved 4 June 2016. McNulty, Phil (12 October 2014). "Estonia v England: How Roy Hodgson's side rated in 1–0 win". BBC Sport. Retrieved 4 June 2016. ↑ The others were Peter Shilton (125), David Seaman (75), Gordon Banks (73), Ray Clemence (61) and David James (53). "England's Goalkeepers by Number of Caps". England Football Online. Retrieved 21 April 2015. ↑ Taylor, Daniel (13 November 2015). "Joe Hart to captain England for Spain friendly in Alicante". The Guardian. London. Retrieved 13 November 2015. ↑ "England: Squad: Final tournament". UEFA. Retrieved 6 June 2016. ↑ de Menezes, Jack (16 June 2016). "England vs Wales Euro 2016: Joe Hart blunder infuriates English fans on Twitter after Gareth Bale goal". The Independent. Retrieved 27 June 2016. ↑ Daly, Jim (27 June 2016). "England goalkeeper Joe Hart takes blame for his performance vs Iceland and claims team deserve criticism". Daily Mirror. Retrieved 28 June 2016. ↑ Flanagan, Aaron (27 June 2015). "Joe Hart wedding: Team-mates past and present including Adam Johnson turn out for Man City goalkeeper's big day". Daily Mirror. London. Retrieved 29 June 2015. ↑ "Games played by Joe Hart in 2002/2003". Soccerbase. Centurycomm. Retrieved 27 March 2016. ↑ "Games played by Joe Hart in 2003/2004". Soccerbase. Centurycomm. Retrieved 30 November 2014. ↑ "Games played by Joe Hart in 2004/2005". Soccerbase. Centurycomm. Retrieved 30 November 2014. ↑ "Games played by Joe Hart in 2005/2006". Soccerbase. Centurycomm. Retrieved 30 November 2014. ↑ "Games played by Joe Hart in 2007/2008". Soccerbase. Centurycomm. Retrieved 30 November 2014. ↑ "Games played by Joe Hart in 2008/2009". Soccerbase. Centurycomm. Retrieved 30 November 2014. ↑ "Games played by Joe Hart in 2010/2011". Soccerbase. Centurycomm. Retrieved 30 November 2014. ↑ "Games played by Joe Hart in 2011/2012". Soccerbase. Centurycomm. Retrieved 30 November 2014. ↑ "Games played by Joe Hart in 2012/2013". Soccerbase. Centurycomm. Retrieved 30 November 2014. ↑ "Games played by Joe Hart in 2013/2014". Soccerbase. Centurycomm. Retrieved 30 November 2014. ↑ "Games played by Joe Hart in 2014/2015". Soccerbase. Centurycomm. Retrieved 25 May 2015. ↑ "Games played by Joe Hart in 2015/2016". Soccerbase. Centurycomm. Retrieved 22 May 2016. 1 2 "J. Hart". Soccerway. Perform Group. Retrieved 8 October 2016. ↑ "Games played by Joe Hart in 2009/2010". Soccerbase. Centurycomm. Retrieved 30 November 2014. ↑ "Hart, Joe". National Football Teams. Retrieved 11 October 2016. ↑ "Player of the month: Joe Hart". Manchester City F.C. Retrieved 15 July 2015. ↑ "Hart voted Etihad Player of the Month". Manchester City F.C. Retrieved 15 July 2015. Wikimedia Commons has media related to Joe Hart.